To get this view I decided that I have to get up to the roof of the Blue Wave Hotel. When the manager took us to the "roof" I nearly had a heart attack! The roof is enclosed by a two storey high wall (to conceal the air condition evaporators), to see the view below I had to climb up a small metal ladder mounted on the wall and stand on two beams on the top! And I hated height! And how do you carry a huge bag of two camera bodies with drives and five lenses AND a huge Manfrotto tripod up that ladder? Well, I was lucky to have young photographer Kevin Tan of The Star with me! We made it to the top when there were still light! Thanks Kevin! The night scene was shot with a Canon EOS1n camera with 28-70 zoom lens on Kodak Ektapress film. Why not digital? Well, the Canon D2000 body I had with me only have 2 mega pixels, a far cry from the 60 MB file I can derive from scanning the negative with my Nikon 4000ED scanner! Footnote: Shah Alam, Selangor's state capital, is a modern township surrounded at its periphery by Kuala Lumpur, Petaling Jaya, and five other major townships including Klang, Bangi, and Kajang. It enjoys a vantage location being ideally located halfway between the national capital, KL, and the viable Port Klang. Hailed as one of the most well-planned cities, Shah Alam has most of its residential area on one side of the Federal Highway and industrial zones on the other. Hence, Shah Alam has been constructed according to a blueprint drawn up with the environment at the forethought of the planners. It has become a showpiece city of the future, free from the inherent problems of haphazard development and shanty towns found in other major growth centers. 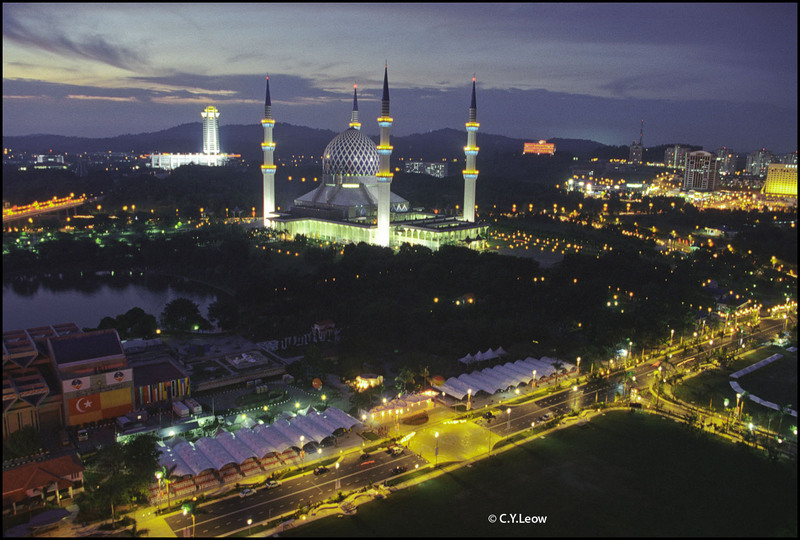 Sultan Salahuhddin Abdul Aziz Shah Mosque is truly one of the finest mosques to be found anywhere in the world. Completed in 1988, its minarets, at 142.3 meters, are the tallest in the world. Its graceful blue dome is also one of the biggest of its kind. Decorative Islamic calligraphy enhances the dome and main prayer hall. Truly beautiful shot CY. Well composed and I enjoy inspecting all the details, as I love this type of photo. This exceptional building is obviously the main attraction, but I like the way the road crosses the bottom of the frame. With the mountains, it makes a pleasing formation to view this building. My attention is "boxed in" so to speak. I'll have to get over there some day too. Great story C Y and I am very pleased that you are still alive because otherwise we could not enjoy this kind of wonderful photo's from you annymore. To see this pic I say it was worth the risk you did take because it's a great one..........Composition and exposure are excellent. Yep! Worth it! And a great story you told. Exciting story, and I think the risk is well worth it. It's an excellent view point, and you took it at the right time - the detail in the sky and ground is all well kept. Of course the correct exposure, which is challenging in this light condition, plays an important role here. The color is excellent. It looks like an interesting city, and the architecture is beautiful. Well, CY, this OUTSTANDING view was well worth a little 'discomfort', wasn't it? Light and colours are absolutely exceptional. The amount of interesting details is stupendous! Its graceful lines & curves are perfectly outlined against the nocturnal background. The lake on the left, with the dark reflection of trees, is beautiful too. A spectacular composition, supported with your interesting informative comment. Awesome story you tell to get this shot, I'm glad everything went fine. The result is very beautyful, the lights, the scene, just amazing. Excellent adventure to get this. Worth every second of fear? Kev sure have a sense of humor! Till next time, go shoot some night scene! ha ha. maybe u can repeat that experience in the here and now in Wellington! !eat your heart out Spiderman!! I didn`t even know there was such a mosque like this in Malaysia.. it is quite stunning. You realise I am in New Zealand, don't you?